New Era Field, originally Rich Stadium, is a stadium in Orchard Park, New York, a suburb south of Buffalo. Opened in 1973, it is the home of the Buffalo Bills of the National Football League (NFL). New Era Cap Company holds the stadium's naming rights. An original franchise of the American Football League in 1960, the Buffalo Bills played their first thirteen seasons at War Memorial Stadium, a multi-use WPA project stadium that opened in 1938, located on Buffalo's East Side. While suitable for AFL play in the 1960s, the "Rockpile" (as the stadium came to be nicknamed), was in disrepair and with a capacity of under 47,000, undersized for a National Football League team. The league mandate instituted after the AFL–NFL merger of 1970 dictated a minimum of 50,000 seats. 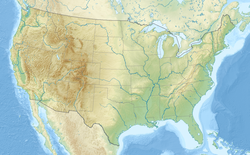 In early 1971, owner Ralph Wilson was exploring options to relocate the team, possibly to Seattle, with other cities such as Memphis and Tampa soon expressing interest as well. The potential loss of the team hastened the stadium project and Rich Stadium opened in 1973. The location and construction of the stadium in Erie County were the source of years of litigation, which ended with a financial settlement for a developer who had planned to erect a domed stadium in Lancaster. However, plans changed because it was not wanted to be close to Lancaster High School. The stadium was ultimately built by Frank Schoenle and his construction company. Bonds were approved by the county legislature in September 1971. The stadium's former name, Ralph Wilson Stadium (1998–2015). Rich Products, a Buffalo-based food products company, signed a 25-year, $1.5 million deal ($60,000 per year), by which the venue would be called "Rich Stadium"; one of the earliest examples of the sale of naming rights in North American sports. (The name was somewhat of a compromise, after Bills owner and founder Ralph Wilson rejected the name Rich wanted to use, "Coffee Rich Park.") By a vote of 16-4, the county legislature approved the name in November 1972, despite a matching offer from Wilson to name it "Buffalo Bills Stadium." When the Bills organization regularly referred to the stadium without the "Rich" name, Rich Products brought a $7.5 million lawsuit against the team in 1976. After the original deal expired after a quarter century in 1998, the stadium was renamed in honor of Wilson. Rich Products balked at paying a greatly increased rights fee, which would have brought the price up to par with other NFL stadiums. On August 13, 2016, Buffalo-based New Era Cap Company and the Buffalo Bills reached an agreement for naming rights. The Bills and New Era officially announced the stadium's new name of New Era Field five days later, on August 18, 2016. The first NFL playoff game at the stadium came in the 1988 season, a 17–10 Bills victory over the Houston Oilers on January 1, 1989. The Bills won every ensuing playoff game at the stadium until they were defeated in 1996 by the Jacksonville Jaguars on December 28. 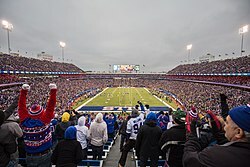 From New Era Field's opening until the end of the 2018 NFL season, the Bills have defeated each of the 31 other teams there at least once and are unbeaten there against the following teams: Arizona Cardinals (4-0), Baltimore Ravens (2-0), Green Bay Packers (6-0), and Tampa Bay Buccaneers (2-0). The stadium is open-air, with a capacity of 71,870. It has never had a natural grass surface; AstroTurf was installed in the stadium upon its opening in 1973. The first renovation occurred in 1984 when the stadium's capacity was increased to 80,290 with the addition of 16 executive suites. Eight years later in 1992, 24 more executive suites were added. In 1994, major renovations were made to the stadium including the addition of the Red Zone and Goal Line clubs that are enclosed in glass and have 500 seats. These renovations also added 14 executive suites. A massive $9.1 million (inflation adjusted) 41.5 by 31.5 feet (12.6 by 9.6 m) Sony JumboTron video scoreboard was a major update in 1994 and was the largest in the U.S. at the time. In 1998, $57 million were spent to refit the stadium with larger seats and more luxury and club seating as a part of the Bills lease renewal with Erie County. This caused the seating capacity to be reduced to just under 74,000. In the 2003 offseason, the original style turf was replaced with a newer AstroTurf product, AstroTurf GameDay Grass (also known as AstroPlay). The lease agreement also stipulated Erie County would continue to upgrade the stadium; in the summer of 2007, a new High Definition Mitsubishi LED board measuring 88.8 by 32.5 feet (27.1 by 9.9 m) was installed and replaced the 13-year-old Sony Jumbotron. Over 1,000 ft of Mitsubishi Diamond Vision LED Ribbon Boards were also installed in the interior during that renovation. The total cost for the 2007 project was $5.2 million, In 2011, the Bills changed their turf to a new product, A-Turf Titan, produced by a Western New York company. As of the 2011 season, Buffalo is the only NFL stadium using the A-Turf Titan product. On December 21, 2012, the lease negotiations between the Bills, Erie County, and the state of New York ended with the Bills signing a ten-year lease to stay in Buffalo until 2023. The agreement included $130 million in improvements to New Era Field. Renovations included new larger entrance gates, larger HD sponsor boards added to each side of the video scoreboard, two new 33.6 ft by 59.84 ft high definition video boards, larger LED sponsor board added on the tunnel end of the stadium, expanded concessions, new team store, and redesign of areas and lots just outside the entrance gates. Buffalo, by virtue of its position downwind of Lake Erie, is one of the nation's windiest cities, and as a result, New Era Field often is a difficult stadium for kickers, with swirling winds that change direction rapidly. This is exacerbated by the stadium's design. The field is 50 feet (15 m) below ground level, while the top of the upper deck stands only 60 feet above ground. The open end lies parallel to the direction of the prevailing winds, so when the winds come in, they immediately drop down into the bowl, causing the stadium's signature wind patterns. The size of the field at New Era Field is specifically designed for National Football League dimensions and sight lines, making it extremely difficult for other outdoor sporting events such as soccer, baseball, track and field, or rugby to be held there. None of any significance have ever been held at the stadium. The stadium annually hosts the region's Section VI and Monsignor Martin Athletic Association high school football playoffs. On July 14, 1984, the stadium hosted a one-time-only supercross motorcycle racing event. The opening ceremony of the 1993 Summer Universiade was held at the stadium. Syracuse University played several home games at the stadium in 1979. Syracuse was left without an on-campus home for one season between the demolition of Archbold Stadium and the construction of the Carrier Dome. The stadium rarely hosts college football games; the stadium hosted a Black Friday contest between the UB Bulls and the Bowling Green Falcons in 2013, but before that, the last college football game at the stadium had been in 1979, when the Syracuse Orange football team used the stadium as a temporary venue while the Carrier Dome was under construction. Adjacent to the stadium is 1,800-seat West-Herr Field, the home field for Erie Community College's football team. On January 1, 2008, the Buffalo Sabres hosted the Pittsburgh Penguins in the first NHL Winter Classic. The Penguins won 2–1 in a shootout in front of 71,217. 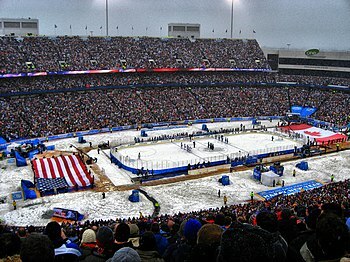 On December 29, 2017, the stadium hosted a match between the U.S. and Canada at the 2018 World Junior Ice Hockey Championships being hosted by Buffalo. Nearly 30 concerts have been held at the stadium, starting in 1974 with Eric Clapton and The Band. Several bands have played the stadium multiple times, including The Rolling Stones, who played there in 1975, 1978, 1981, 1997, and 2015. The Grateful Dead played the stadium a few times in the 1980s and early 1990s with their July 4, 1989 Truckin' Up to Buffalo performance being documented on CD/DVD. The Who, Dave Matthews Band, and The Jackson Five have all played at the stadium multiple times as well. Double and multi-billed concerts have also been scheduled at the stadium. There were notable large concerts that were scheduled to take place at the stadium but were later canceled. Led Zeppelin was set to perform at the stadium on their 1977 North American Tour. The concert was one of the seven remaining concerts on the tour that were canceled due to the death of lead singer Robert Plant's son. A Bruce Springsteen concert, that was originally scheduled at the stadium in 2003, was moved to the smaller Darien Lake Performing Arts Center due to low ticket sales. Concert appearances began to wane in the 1990s at the stadium, which ended with Dave Matthews Band and NSYNC each playing a concert in June 2001, with no more concerts at the stadium for 14 years. 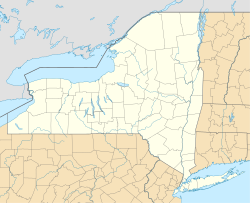 The combination of a declining number of stadium rock acts, population decline, and the availability of other, more intimate, venues in Western New York such as Artpark in Lewiston, Darien Lake Performing Arts Center in Corfu, the Thursday at the Square series among others, Seneca Niagara Casino, and the KeyBank Center, which opened in 1996, replacing Buffalo Memorial Auditorium in downtown Buffalo. July 4, 1989 Grateful Dead 10,000 Maniacs — — — This show was documented on the CD/DVD Truckin' Up to Buffalo. June 10, 2001 NSYNC BBMak PopOdyssey 43,406 / 55,874 $2,175,436 These two concerts were the last at the stadium for more than a decade. The stadium has also hosted the Drum Corps International championships three times. Autocross racing events are held in the one of the stadium's parking lots during the spring, summer, and fall months. The local WNY SCCA Chapter hosts the autocrosses. Although new stadium ideas had been proposed before the death of Ralph Wilson, with the new ownership of Terry and Kim Pegula, the prospect of a new stadium has been raised again. During his press conference to acquire the team, Terry Pegula stated, "we will gradually proceed to plan and design a stadium for the Buffalo Bills." Since the Bills moved from War Memorial Stadium into their current home, it has been noted that the team has not won a championship since, and has had frequent periods of heartbreak. Several writers have owed this to the fact that the stadium is built just yards away from a family cemetery as part of territory once owned by the Sheldon Family. A plaque just outside the stadium at gates 6-7 graces the cemetery and also notes that the stadium was built on the site of an ancient Wenro village. Buffalo's downtown skyline as seen from upper deck during dusk. New Era Field (then Ralph Wilson Stadium) from above. Night view of the stadium exterior after recent renovations. ^ a b Baker, Kelly (August 18, 2016). "A Look Through History of the Home of the Buffalo Bills". Buffalo Bills. Retrieved August 21, 2016. ^ "Dave M. Berg Spring 2006 Newsletter" (PDF). ^ "The Old Rockpile". rockpile.buffalonet.org. Retrieved September 7, 2017. ^ BALLPARKS.com by Munsey and Suppes. "War Memorial Stadium". football.ballparks.com. Retrieved September 7, 2017. ^ "Bills may move team to Seattle". Spartanburg Herald. Associated Press. January 13, 1971. p. 10. ^ "Bills consider transfer". Michigan Daily. Ann Arbor. Associated Press. Jan 13, 1971. p. 9. ^ "Buffalo Bills may shift to Seattle". Bryan Times. UPI. January 13, 1971. p. 10. ^ "Memphis, Tampa express interest in Buffalo Bills". Spartanburg Herald. Associated Press. January 15, 1971. p. 14. ^ a b "Buffalo making efforts to retain grid franchise". Wilmington Star-News. UPI. January 20, 1971. p. 12. ^ "Ralph Wilson Stadium in Orchard Park, NY 14127". Citysearch. Retrieved September 7, 2017. ^ "Domed stadium out at Buffalo". Milwaukee Journal. press dispatches. January 20, 1971. p. 18. ^ "Buffalo scraps stadium plans". Spartanburg Herald. Associated Press. January 21, 1971. p. 36. ^ "Stadium History". history.buffalobills.com. Archived from the original on June 20, 2014. Retrieved September 7, 2017. ^ "Erie County legislators ok Buffalo stadium bond". Lewiston Morning Tribune. Associated Press. September 24, 1971. p. 15. ^ "Bond boost passes, Bills get stadium". Milwaukee Journal. September 24, 1971. p. 16, part 2. ^ "Bills stadium bonds approved". Miami News. Associated Press. September 24, 1971. p. 2B. ^ Fauber, John (May 17, 1989). "What's in a name?". Milwaukee Journal. p. 8C. ^ Kwiatkowski, Jane (June 28, 2011). "Tales From a Life Full of Buffalo Sports History". The Buffalo News. Retrieved June 29, 2011. ^ "'Rich Stadium' name selected". Lawrence Journal World. Associated Press. November 8, 1972. p. 35. ^ "Stadium name a costly bill". St. Petersburg Independent. Associated Press. October 31, 1972. p. 4C. ^ "Bills exercise veto on name". Milwaukee Journal. May 8, 1973. p. 20. ^ "Bills lose fight to name stadium". Milwaukee Journal. Associated Press. May 17, 1973. p. 12. ^ "Rich sues Bills for $7.5 million". Observer Reporter. Washington, Pennsylvania. Associated Press. September 22, 1976. p. B-6. ^ a b Warren, Matt (May 9, 2009). "On the naming rights to Ralph Wilson Stadium". SBNation. Retrieved August 19, 2016. ^ "Bills agree to a naming rights deal for the stadium". Buffalo Bills. August 13, 2016. Retrieved August 18, 2016. ^ "New Era Cap takes over stadium naming rights for Buffalo Bills; Team to now play at New Era Field" (Press release). Buffalo Bills. August 18, 2016. Retrieved August 18, 2016. ^ a b "2015 Buffalo Bills Media Guide" (PDF). Buffalo Bills. August 28, 2015. Retrieved August 18, 2016. ^ Wawrow, John (2012-12-21). "Bills staying put after agreeing to new lease". Yahoo! Sports. Retrieved December 21, 2012. ^ "Leypoldt Boosts Bills to Victory". The Victoria Advocate. October 1, 1973. Retrieved September 26, 2011. ^ Powers, John (December 16, 1984). "Ease on Down the Road: NFL Clubs Are Packing It In for New Cities and Sweetheart Deals". The Boston Globe. Retrieved September 26, 2011. ^ "League Extends TV Blackout Deadline for Bills Game". The Buffalo News. December 25, 1995. Retrieved September 26, 2011. ^ Bouchette, Ed (September 1, 1999). "Bettis Practices Despite Swelling". Pittsburgh Post-Gazette. Retrieved September 26, 2011. ^ "Rain Chases Saints Indoors in Final Heavy Practice for Bills". The Baton Rouge Advocate. September 7, 2001. Retrieved September 26, 2011. ^ Gaughan, Mark (September 26, 2008). "Deferring on Opening Kick Is a Growing Trend". The Buffalo News. Retrieved September 26, 2011. ^ "2014 Buffalo Bills Media Guide" (PDF). Buffalo Bills. Retrieved August 24, 2014. ^ "Bills to Host High School Football Playoff Game at Ralph Wilson Stadium". wkbw.com. Archived from the original on November 5, 2011. Retrieved September 7, 2017. ^ "WORLD UNIVERSITY GAMES; A Bit of Athletic History Is Made in Buffalo". The New York Times. July 8, 1993. ^ "Bowling Green vs. Buffalo - Game Recap - November 29, 2013". ESPN. November 29, 2013. Retrieved September 7, 2017. ^ Rosen, Dan (December 24, 2017). "2008 NHL Winter Classic: An oral history". NHL.com. Retrieved February 18, 2018. ^ "Snow surprise: Sid the Kid ices Sabres". Eugene Register-Guard. Oregon. Associated Press. January 2, 2008. p. C2. ^ "Canada faces U.S. outdoors at 2018 WJC". TSN.ca. Bell Media. Retrieved October 28, 2016. ^ Chidley-Hill, John (29 December 2017). "U.S. beats Canada in shootout at first world junior outdoor game". The Globe and Mail. Retrieved 31 December 2017. ^ "ROCKS OFF SETLISTS". rocksoff.org. ^ "Truckin' Up To Buffalo (Part One of An Interview with Grateful Dead Archivist David Lemieux)". www.jambands.com. ^ "Rich Stadium - June 13, 1993 - Grateful Dead". www.dead.net. ^ Ruberto, Toni (October 23, 2014). "One Direction to play Ralph Wilson Stadium". Buffalo.com. Retrieved August 19, 2016. ^ "U2 to play New Era Field Sept. 5". wivb.com. Retrieved September 7, 2017. ^ Rodak, Mike (October 10, 2014). "Terry Pegula: Stadium will take time". ESPN. Retrieved October 31, 2014. ^ Minetor, Randi (Oct 1, 2015). "Chapter 1: Ancient Unsportsmanlike Souls". Cursed in New York: Stories of the Damned in the Empire State. Globe Pequot Press. p. 5-11. ISBN 1493013769. ^ Roth, Leo. "Roth: The Buffalo Bills' ghostly gridiron". Democrat and Chronicle. Retrieved December 27, 2015. ^ Aaron Lowinger (June 2012). "The Bills Curse". Buffalo Spree. R. Minetor, Cursed in New York: Stories of the Damned in the Empire State, Globe Pequot Press, 2015. Includes a section about the stadium's potential "curse"
Wikimedia Commons has media related to New Era Field.